Our faith life is centered on the Eucharist — the source and summit of our Christian life. With a history that spans almost 60 years, St. Michael’s strives to create a home for everyone and has been a place where people have encountered the love of God. Our entire parish community is on a mission to heal wounds and warm the hearts of those whom God places in our lives. Through a life of worship, prayer, and generosity, we form disciples — sent out as medics to show God’s love and mercy through their personal witness. For non-Catholics: We’d love to get to know you! Click here for more information. For Catholics: To join the parish, click the button below and register as a parishioner. Once we receive your information, we’ll get in touch with you. Vision: To be Calgary’s model spiritual field hospital: because each believer is a medic, sent out from the Eucharistic celebration to warm the hearts and heal the wounds of those suffering in life. Mission: St. Michael Catholic Community is a Spirit-filled church where all may experience that they are seen, known, and loved by God, and who share this encounter with others. We will fulfill our mission by living out our values: worshipping in the Eucharist, cultivating a life of prayer, relating with others in fellowship, drawing others to Jesus through disciple-making, and creating a culture of generosity by sharing our time, talent, and treasure. Your financial donations go a long way in building up the Kingdom of God. Because of your generosity, we are able to do more for everyone in our parish community and beyond. Visit saintmichael.ca/giving to learn how you can help. We are looking for people who have a heart to serve and possess the necessary skills to help in building God’s Kingdom. View current openings at saintmichael.ca/jobs. Where is St. Michael's Located? We are at 800 85th St. SW, Calgary, AB, in the southwest Calgary community of West Springs. Are you open on weekdays? Absolutely: normally, our parish office is open Mon-Thurs from 8:30 a.m. to 8:30 p.m. and until 4 p.m. on Fridays. However, our office hours and Mass times could change during Christmas, Lent/Easter, or during the summer. For the most up-to-date info regarding Mass times and office hours, click here. My baby needs to be baptized, while my eldest needs to be confirmed. What should I do? Check out the sacraments section – you will find everything you need there. Do you have a Sunday program for children? We certainly do. Kid’s Kingdom (age 3-grade 3) runs every Sunday during the school year during the 9:00 a.m. and 11:00 a.m. Masses, except on long weekends. The program begins 10 minutes prior to Mass, and children must be signed in by their parents. Click here to learn more. How do we get married in the Catholic Church? There are several steps in the process to prepare you to marry in the Catholic Church. To get started, email us at marriage@saintmichael.ca and we will arrange to meet with you and work with you through the process. Father gave a great homily this weekend. How can I get a copy of it? Yes, they are available at the media section. Although we consistently record the weekend homilies, we can’t guarantee that all homilies will be available online. We also post homily videos on Facebook. I want to serve our parish but not sure how or where. What can I do? Wonderful! Praise God for calling you to serve in the Church. Checkout the ministries page for a list of the different ministries and programs that you could help at. Where does the money that I donate go to? Great question. The money you donate is used to fund the ministries, programs, and outreach endeavors of the parish. 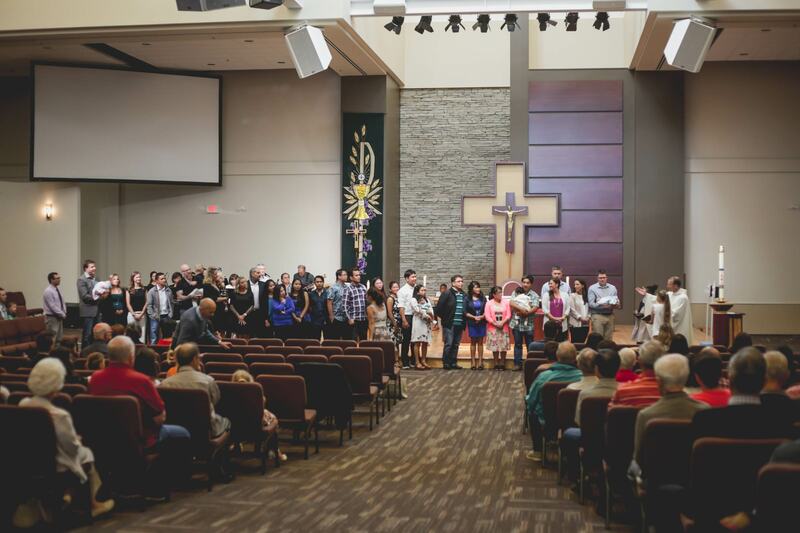 In addition, it is used to fund the operating and maintenance costs of the church building, office and administration expenses, as well as funding support for the Diocese of Calgary. What is the Parish Leadership Council? The Parish Leadership Council, or PLC, serves as a consultative body to the Pastor: making recommendations, including review and recommendation of all parish ministry plans. They can be reached via email at plc@saintmichael.ca.